In what had the potential to be a promising election cycle for his party in races for governor, Barack Obama saw Democrats lose four races by single digits (Indiana, Missouri, New Hampshire, Vermont) and ended up with a net loss of two seats – winning six states and losing six. 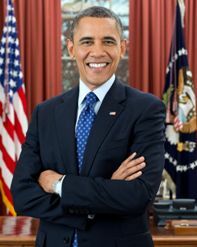 That brings President Obama’s electoral record in gubernatorial races to a close, with 108 such contests taking place since his inauguration in January 2009. And while the president received much more attention for the losses he suffered in the U.S. House and state legislatures during his eight years in office, his party’s record in gubernatorial races also ended up as one of the worst in modern political history. 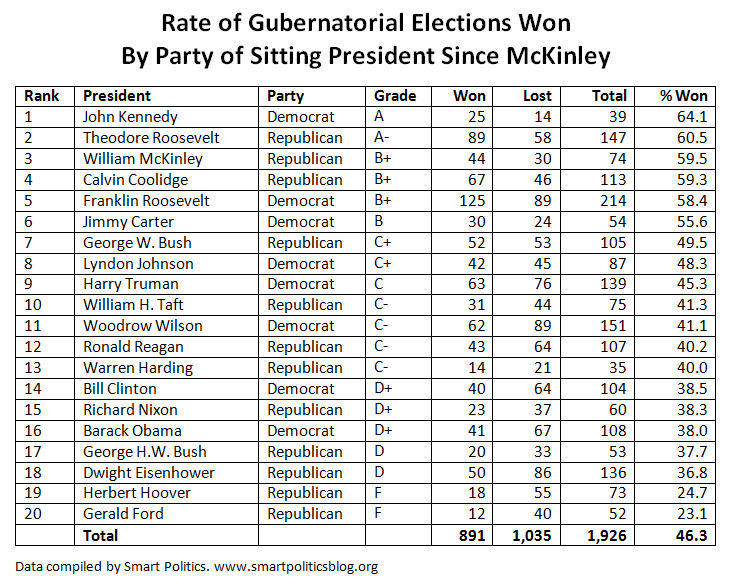 Smart Politics examined the more than 1,900 gubernatorial elections conducted since William McKinley’s administration and found that Barack Obama has the fifth lowest rate of gubernatorial wins for his party (38.0 percent) out of the 20 presidents to serve since 1897. That’s better than only four presidents to serve since the late 19th Century: Gerald Ford at 23.1 percent (12 of 52), Herbert Hoover at 24.7 percent (18 of 73), Dwight Eisenhower at 36.8 percent (50 of 136), and George H.W. Bush at 37.7 percent (20 of 53). Overall, the party of the president has been victorious in 46.3 percent of gubernatorial elections since 1897 – winning 891 races and losing 1,035. To be sure, most presidents over the last century-plus have seen their party endure more losses than record wins in gubernatorial elections during their administrations. Of the 20 presidents to serve since 1897, only six have seen their party win a majority of elections for governor, and only one who served in the last half-century: Republicans William McKinley, Teddy Roosevelt, and Calvin Coolidge and Democrats Franklin Roosevelt, John Kennedy, and Jimmy Carter. Kennedy, who was in office while 39 gubernatorial elections were conducted from 1961 to 1963, saw Democrats win 25 of them, or 64.1 percent – highest among all presidents to serve in the 20th and 21st Centuries. Teddy Roosevelt is next, with Republicans winning 60.5 percent of races for governor from 1901 through 1908 (89 of 147 contests). No other president over the last 110+ years saw his party win 60 percent of the races for governor while he was in office. McKinley came close, with Republicans carrying 44 of 74 elections for governor from 1897 through 1900 (59.5 percent) and the GOP also won 67 of 113 races under Coolidge from 1923 through 1928 (59.3 percent). Democrats won 125 of 214 gubernatorial elections during the tenure of Franklin Roosevelt from 1933 until his death 1945, or 58.4 percent. Roosevelt, of course, was in the White House during the Democratic waves of 1934 and 1936 when the party won 73.5 percent (25 of 34) and 80 percent (28 of 35) of gubernatorial elections respectively. Including the few contests that were held in 1933 and 1935, Democrats were victorious in 77.8 percent of the gubernatorial races held during Roosevelt’s first term (56 wins, 16 losses). That pace was unsustainable, however, and FDR saw his party win less than half of the races for governor conducted over the next eight years of his administration through the Election of 1944 – winning just 69 of 142 elections, or 48.6 percent. The only other president to serve in the White House since the late 19th Century and see his party win a majority of gubernatorial contests was Jimmy Carter. Democrats claimed 30 of 54 gubernatorial elections while Carter was in office (55.6 percent) including 21 of 36 in the 1978 midterms and even six of 13 in 1980 when Carter was trounced in his reelection bid. During the 1980 cycle, five Democratic incumbents prevailed in New Hampshire (Hugh Gallen), North Carolina (Jim Hunt), Rhode Island (John Garrahy), Utah (Scott Matheson), and West Virginia (Jay Rockefeller) as well as their nominee in Montana (Ted Schwinden) despite Carter’s approval ratings hovering in the mid-30s on Election Day. Carter is the only president since John Kennedy to be above water by this measure. The remaining 15 presidents to serve in the 20th and 21st Centuries all saw their parties lose more gubernatorial races than they won. The Republican Party came quite close to breaking even during the George W. Bush years – winning 52 of 105 races during his administration, or 49.5 percent. Republican gubernatorial candidates were 30-23 during Bush’s first term but just 22-30 during his second. Lyndon Johnson has the eighth best mark during this span at 48.3 percent (42 of 87) – buoyed in large part by the Election of 1964 when Democrats won 18 of 26 seats. Next is Harry Truman at 45.3 percent (63 of 139), William Howard Taft at 41.3 percent (31 of 75), Woodrow Wilson at 41.1 percent (62 of 151), Ronald Reagan at 40.2 percent (43 of 107), Warren Harding at 40.0 percent (14 of 35), Bill Clinton at 38.5 percent (40 of 104), and Richard Nixon at 38.3 percent (23 of 60). Another way to examine the difficulties Democratic nominees endured in gubernatorial races during the Obama years is to highlight their thin track record in picking up Republican-held seats. Roy Cooper’s razor-thin 0.2-point victory in North Carolina against GOP Governor Pat McCrory was just the ninth Democratic gubernatorial pick-up out of 54 opportunities during Obama’s tenure (16.7 percent), of which only two were sitting Republican governors. Democrats had previously won Republican-held open seats in California (2010, Jerry Brown), Connecticut (2010, Dan Malloy), Hawaii (2010, Neil Abercrombie), Minnesota (2010, Mark Dayton), Vermont (2010, Peter Shumlin), Virginia (2013, Terry McAuliffe), and Louisiana (2015, John Bel Edwards). McCrory is just the second Republican governor to suffer a general election loss to a Democratic nominee during the Obama years joining Pennsylvania’s Tom Corbett in 2014 (to Tom Wolf). In three of these states (Virginia, Pennsylvania, and North Carolina) Democrats first lost control of the governorship under Obama (in 2009, 2010, and 2012 respectively) and then later picked off the seat from the GOP. By contrast, with pick-ups in open seats this cycle in Missouri (Eric Greitens), New Hampshire (Chris Sununu), and Vermont (Phil Scott), Republicans notched 22 of 54 gubernatorial pick-up opportunities since Obama took office, or 40.7 percent – more than twice the rate recorded by Democrats. The GOP also picked up two seats in 2009 (New Jersey, Virginia), 11 in 2010 (Iowa, Kansas, Maine, Michigan, New Mexico, Ohio, Oklahoma, Pennsylvania, Tennessee, Wisconsin, Wyoming), one in 2012 (North Carolina), four in 2014 (Arkansas, Illinois, Maryland, Massachusetts), and one in 2015 (Kentucky). 1 Comment on "Obama’s Gubernatorial Election Report Card: D+"
1. Was this graded on a “curve,” or was it based on a so-called absolute scale (e.g. a hard F for any and all sub-25%)?